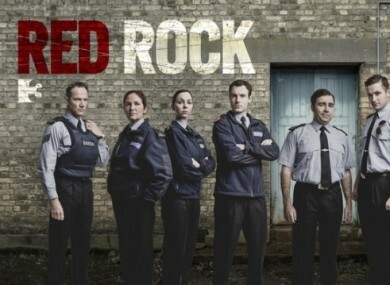 TONIGHT, TV3 AIRED the first episode of Red Rock, the highly-anticipated new Irish soap. Set in a harbour town, it’s billed as a cross between a soap and a police procedural. In tonight’s episode, the action kicked off with the discovery of the body of Darren Kiely. Following that dramatic opening, we were introduced to the members of the two feuding families at the centre of the drama, the Kielys and the Hennessys, as well as the local Guards. But is it worth tuning in to? Put it this way: if you like soaps, Red Rock is fairly entertaining, even just for the fact that it’s Irish. If soaps aren’t your cup of tea, Red Rock probably won’t appeal to you. Still unsure? Here’s everything you need to know from the first episode. HEADS UP: Here be spoilers. All soaps live or die by their theme songs. Coronation Street, Eastenders, Fair City – they all have iconic theme music. What has Red Rock opted for, you ask? A fairly gloomy number with a lot of harmonica that’s incredibly jarring whenever it’s inserted at the end of a scene/ad break. In tonight’s episode, a young man is found with a serious head injury. He is soon identified as Darren Kiely. The guy who assaulted him? Michael Hennessy. Because the Kielys and the Hennessys have an intense beef that’s gone on for years. We know this because one of the guards literally likens their feud to the Troubles in Northern Ireland. The North had troubles. The Hennessys and Kielys were at war. As demonstrated by the gold necklaces, bathrobes and cigarettes. As exemplified by the prim skirt suits, buns and lack of discernible accents. In fact, they all sort of behave like they’re in Downton Abbey. Despite hailing from rival families, Katie Kiely and David Hennessy appear to be scoring one another. That is, until David’s brother kills Katie’s brother and David’s mother fires Katie from the pub. Can their love overcome such adversity? Because he’s a cop and that’s how cops talk. The Sergeant is also referred to as “sarge” by the other guards, just in case we ever forget that this is a show about guards. Meet Paudge. He’s basically the Chief Wiggum of Red Rock. When he and his colleague find the body of Darren Kiely, he won’t shut up talking about property, despite the fact that a dying man is lying in front of them. He hates working and complains about it to an almost comical degree. Needless to say, he gives the guards a really good name. While examining CCTV footage for the assault, Garda Sharon Cleere stumbles upon footage of a senior guard shifting a schoolgirl in his car. She doesn’t tell Paudge about what she has uncovered, so he continues to act like King Doofus. We see what you’re trying to do here. Well, it wouldn’t be a soap if it didn’t include concerned looks, would it? Did you tune in to tonight’s Red Rock? What did you think? Email “12 things we learned from the first episode of Red Rock”. Feedback on “12 things we learned from the first episode of Red Rock”.